2. TLP hull loaded diagonally onto the ship (the configuration ultimately selected, see photograph below). For the structural and fatigue analysis of the TLP hull, detailed ship motion responses were provided for a number of sea states and the full range of wave directions from head seas to stern seas. 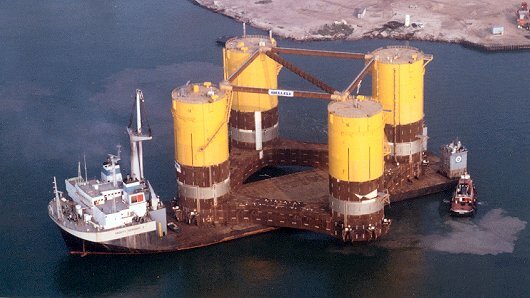 Photograph courtesy of Dockwise Shipping BV. Calculation of the motion/acceleration responses for a range of sea states/wave headings.